I was a pretty good kid, but whenever I misbehaved, the best way to put me back in line was to threaten to take me to Roger’s Flea Market. If I let the dishes pile up too high Mom would say something like “Do the dishes or we’re going to Roger’s Flea Market!” It usually worked. Owing to such a colorful and diverse cast of characters, you are always guaranteed a good meal at a flea market. It is not, however, always guaranteed that you will find a produce stand that is completely free of moldy tomatoes, limp broccoli, or badly bruised peaches. Here’s my take on the two flea markets I’ve visited in St. Augustine and Jacksonville in the past couple months. 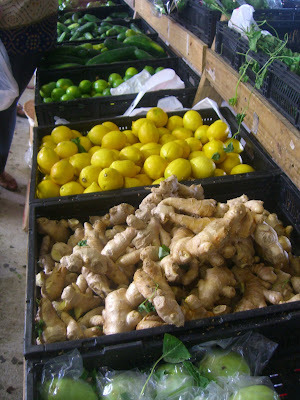 In another post, I’ll talk about the excellent farmers’ markets in the area. …and all sorts of exciting goodies I can’t yet identify. 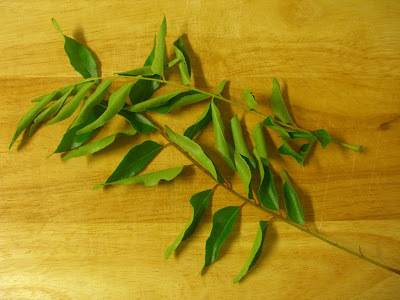 I was beyond ecstatic to find produce I hadn’t seen since returning from Australia, like curry leaves, which are used all the time in Indian cooking and are all over the markets and stores in Australia but difficult to find here in the States. I nearly did a cartwheel when I found culantro!! 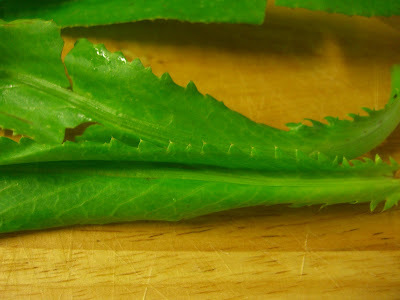 Not to be confused with cilantro, culantro is a long leaf of an herb, and you can identify it by its jagged edges. 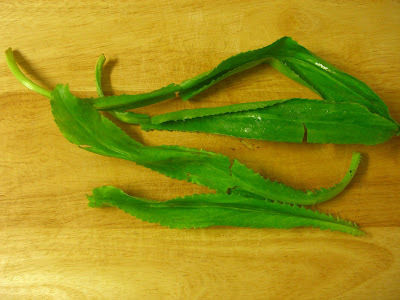 It’s used extensively in Puerto Rican cooking, especially in sofritos, and I was never able to find it in Boston or in Australia. I was happy to learn that it’s also used across Asia to season foods! The flavor is similar to cilantro. Some say it’s stronger, but I disagree – I just think it’s different. Phil doesn’t really love cilantro, but he thought the Puerto Rican rice and beans I made using culantro was one of the best batches I’d ever whipped up. 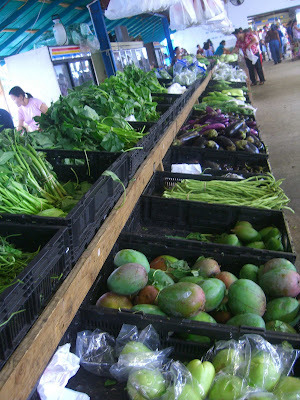 The Beach Blvd Flea Market also offers non-ethnic produce. One vendor was selling sugar plums, and I had to pick them up because they are only available for a very short window of time which here in the South occurs around mid-June. 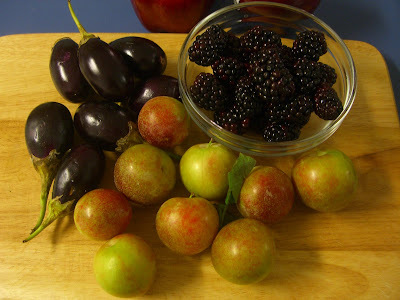 Here they are with their friends the blackberry and the Indian eggplant. 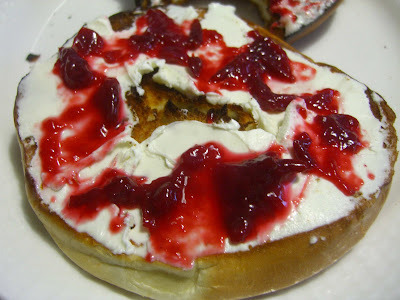 The next day, I made a quick and easy batch of sugar plum preserves. The skin of sugar plums isn’t bitter like some other plums, and the preserves turned out pleasantly sweet with a bit of a sour tang. My recipe was loosely based on this one. 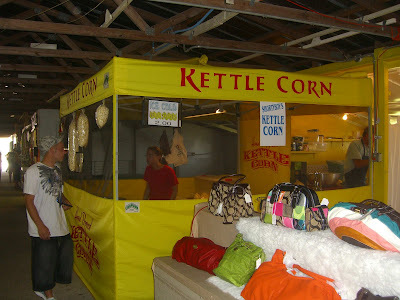 I’ve tried prepared food from two stalls at this flea market, one offering Vietnamese food, the other Mexican. 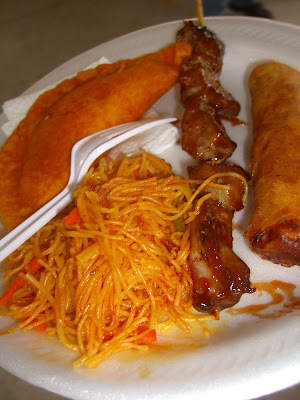 The Vietnamese vendor offers a combination plate of a beef empanada, noodles, a chicken skewer, and a lumpia. 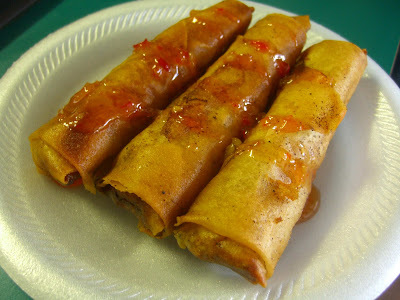 We shared it between three people, and also ordered some extra lumpia. 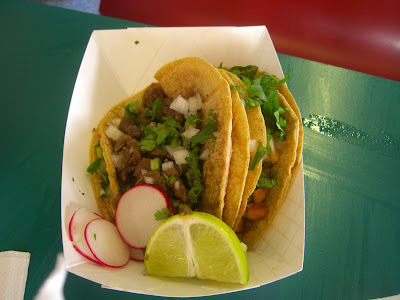 On another visit, we order tacos from the Mexican stall. The corn tortillas are warmed on a griddle and filled with your choice of carnitas (fried pork), chicken, steak, pork, or lengua (tongue). After we order the carnitas, chicken, and steak tacos, they were topped with chopped onions and cilantro and garnished with radishes. The tacos were very dry so we moistened them with a squeeze of lime and doused them in the smooth mango salsa available on the counter. I topped mine with a very spicy, bright red hot sauce. I will return again and again to this flea market, and in later posts will share recipes for all the Chinese and Puerto Rican meals that have come from the bounties I take home. St. Augustine’s St. John’s Flea Market has a VERY different vibe. It’s located in the boondocks, and the only language spoken here is heavily Southern-accented English. There is no ethnic produce of any kind. In fact, I wouldn’t recommend buying produce here at all, as the corn and peaches and tomatoes and zucchini I saw seemed completely overwhelmed by the heat and humidity. Let’s just say that they’d seen better days. Instead, come for the food. 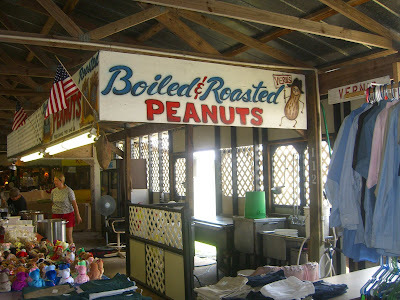 You can, of course, get Boiled & Roasted Peanuts. 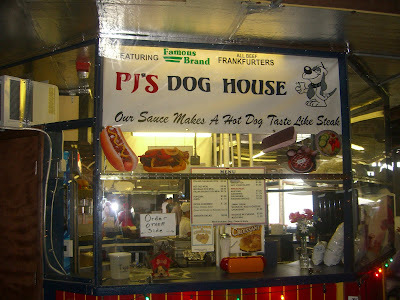 Or a dog from PJ’s Hot Dog House, where apparently their Sauce Makes a Hot Dog Taste Like Steak. Quite intriguing. 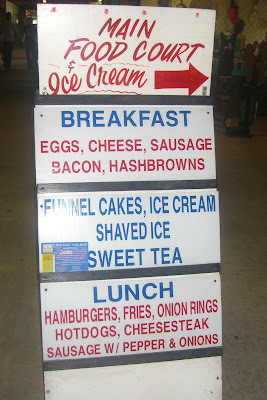 You could even head over to the food court and pick up some funnel cakes, sweet tea, hamburgers, fries, onion rings, and ice cream, whilst enjoying a soothing background of country music karaoke. But I myself would highly recommend heading over to the Price Family BBQ cart. 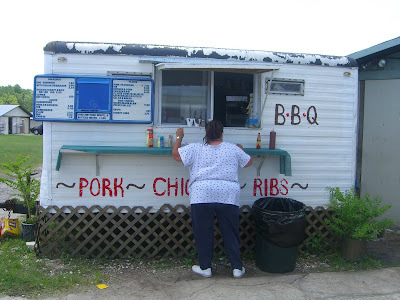 This is exactly the type of place where you can expect some pretty stellar BBQ, and Price Family BBQ did not disappoint. Phil and I shared a pork sandwich and a cup of baked beans. The chopped pork had little bits of crispy pork skin and was laced with tender meat and fat, which made it incredibly moist. And wow, those beans. I’m a huge sucker for baked beans. I eat Heinz baked beans cold, straight from the can. In fact, I had mini cans of baked beans in my desk when I was studying in Australia, and when I wanted a snack but was too lazy to head upstairs to the kitchen for a fork, I would pop open the beans and drink them like a chunky milkshake. I know. 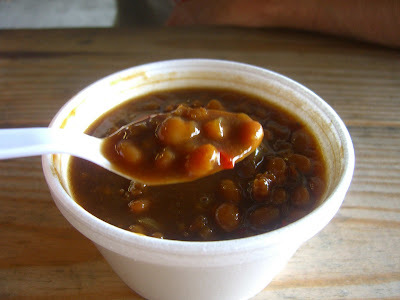 So really I guess I’m easy to please, but these baked beans just went above and beyond, with their rich brown sugar sauce and hunks of shredded, barbecued meat. 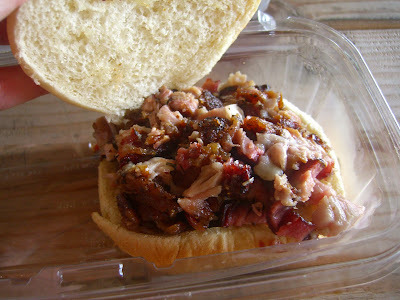 In a nutshell, I would head over to Jax’s Beach Boulevard Flea Market for an amazing selection of produce, and I would rush to the St. John’s Flea Market in St. Augustine for some to-die-for barbecue. i have never been to that flea market, nor have i ever been interested in going to that flea market...but now, thanks to this blog post: i am going to that flea market! it's probably the only shopping i can afford these days! Jeannie, glad the post motivated you to go, it really is quite a gem! Pls report back on what you find, you could go there every week and find something new each time! 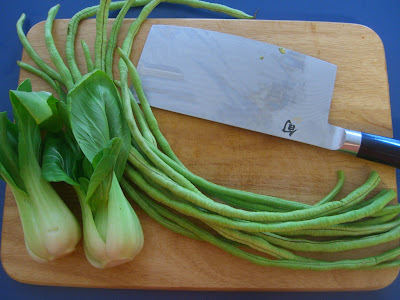 Thank you for your Blogg, I know I will find most of my cooking herbs; the 3 must have herb for Southeast Asian cooking are Kaffir Lime leave, Lemon Grass, Galanga.